This program teaches strength, energy, and precision. It is a dance in which rhythm is sounded out by clicking taps on the heels and toes of dance shoes. This also develops sound discrimination, rhythm, and coordination. Students will learn a full range of steps, which are then placed into combinations and sequences. 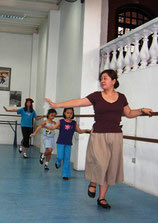 All tap students are encouraged to take ballet as well.